iii) Prime circle(5 marks) 1(d) State and explain law of belting. (5 marks) 1(e) Differentiate between in-volute and cycoidal gear tooth profile. 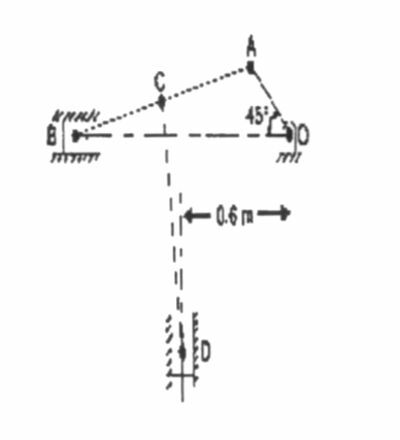 (5 marks) 2(a) The driving crank AB of the quick return mechanism as shown in figure revolves at a uniform speed of 150 rpm. 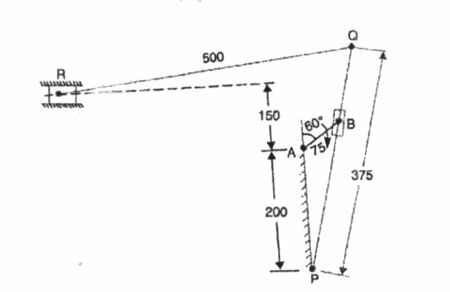 Find the velocity and acceleration of the toolbox R, in the position shown, when the crank make an angle of 60° with the vertical line of centres PA. What is the acceleration of sliding of the block at B along the slotted lever PQ? Determine for the given configuration, the velocity of the slider D if the crank OA rotates at 100 rpm in the clockwise direction. Also find the angular velocity of the link CD. Use instantaneous center method. i) Follower to move outwards through 25mm during 120° of cam rotation. iii) Follower to return to its starting position during next 90° of cam rotation. iv) Follower to dwell for the rest of the cam rotation.